This project was a Christmas gift for a dear friend in Alaska. In the picture it sits upon the chest it was modeled after. So far as possible it was fabricated as an exact half-scale duplicate although I deviated a bit by accident and by intent. The curves of the feet varied by accident. The structure of the drawer front varied by intent since making half-blind dovetails in stock so thin eluded me and time was short to get the project done and shipped. Overall, the time put into it suggests that bigger is easier. Joinery in ⅜-inch stock is simply much less forgiving than in ¾. Joining difficulties aside, I did manage to put in the same sort of through-dovetails that are featured in the larger version. 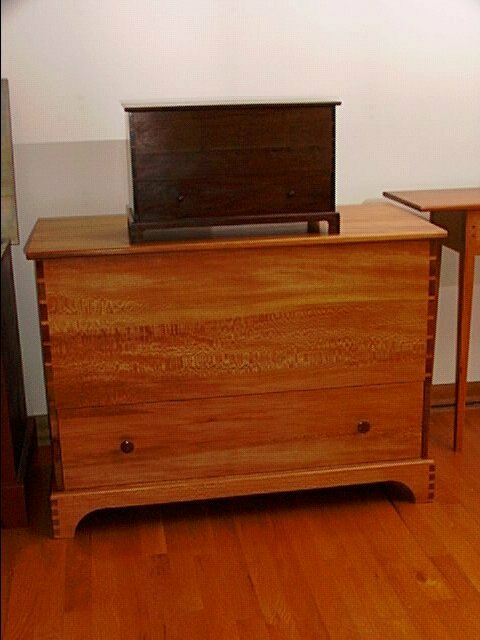 The chest is completely built of local black walnut with the exception of the drawer and chest bottom which are aromatic cedar as in the original. It is finished in boiled linseed oil and padded-on garnet shellac. Size is unavailable but it is as close to half of the sycamore chest as could be managed.